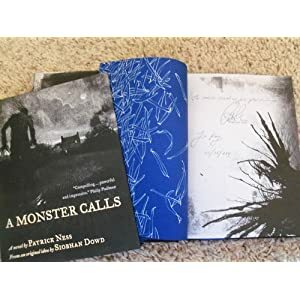 I read A Monster Calls by Patrick Ness based an idea Siobhan Dowd had when she was dying of breast cancer. I loved everything about it. But be warned, you’ll want to have a box of tissues handy when you read it. I don’t want you to think this is a one note band sort of book. It’s a complex story about family, friendship, and bullying in addition to exploring the way in which young people come to terms with death. It’s a story that embraces realism as well as the dreams and the interplay and tensions between the two. I am disappointed that this wonderful book hasn’t received more attention, but I’m not all that surprised. For starters, it’s about thirteen year old Conor whose mother is dying of cancer. This is a difficult subject, and one that does not speak to every reader. It’s also an illustrated text, which some young adult readers may be inclined to shy away from, yet the story is rich and complex. This in turn leads to the question as to which category this powerful story best fits into; middle grade or young adult. It really is a book whose point of view is firmly grounded in childhood even while the main character is on the cusp of being a young adult. I’m sure that the question of where to shelve it has been much discussed in both libraries and bookstores. I suspect that creative booksellers and librarians shelve it in both spots, but most books don’t cross over quite so well when it comes to awards. Still, A Monster Calls is one of the most compelling books I’ve read recently and I do hope it finds it’s way into the hands of young people on both sides of the intermediate and young adult spectrum. Awards are wonderful for bringing a book to the attention of readers. But, this is one of those books that probably won’t win many awards even though it is brilliantly written and illustrated. Instead, it will likely be reliant on astute librarians, teachers, and other adults to put it into the hands of young readers who will most benefit from it.